It’s amazing! She goes into the different archetypes that live in that deeper part of our mind, we can have one or a couple and there was one that I really resonated with the Artist/Creative archetype and it really brings light to who you are. Caroline goes through your life journey, your unique challenges and lessons, which were to overcome the fear of not being original and to not diminish or ignore my talent but instead develop my unique gift. Can I develop my talent and express myself, or will fear of failure or humiliation hold me back? That was a profound shift for me, I could really relate to that in sssoooo many ways. She goes into our shadow aspect of self, our behaviours and patterns... and this was fear of being unacknowledged for my artistic gifts or resentful if I chose not to develop my inner Artist/Creative. Have you ever wondered why you are drawn to certain people, ideas, or products and turned off by others? Are you constantly searching for something you can’t put your finger on, or wondering whether you are living a life that truly fits? 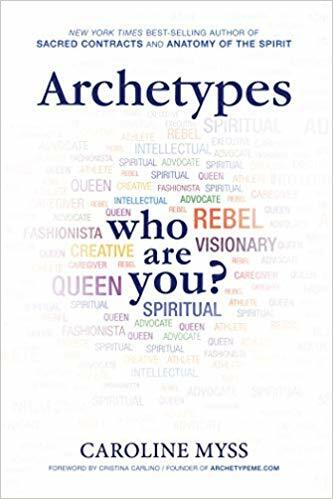 In Archetypes: Who Are You?, New York Times best-selling author Caroline Myss delves into the world of archetypes, which have been the subject of her work for more than 25 years. Archetypes are universal patterns of behavior that, once discovered, help you better understand yourself and your place in the world. In short, knowing your archetypes can transform your life. Within the pages of this book, Myss writes about ten primary feminine archetypes that have emerged in today’s society: the Caregiver, the Artist/Creative, the Fashionista, the Intellectual, the Rebel, the Queen/Executive, the Advocate, the Visionary, the Athlete, and the Spiritual Seeker. In each chapter, she explains one individual archetype, showing how it has evolved and then in fascinating detail lays out the unique characteristics, the defining graces, the life challenges, and other information to help you understand if you are part of this archetype family and if so, how you can fully tap into its power. She also offers tips and practical advice on how to fully engage with your archetypes. Learning which archetypes best describe you is just the beginning. You can then use this knowledge to make more conscious decisions about everything from careers to relationships, avoiding common pitfalls of your personality type while playing up your strengths. The result is a happier, more authentic you. It’s never too late to change your life by embracing your archetypes to the fullest. So are you a Rebel? An Artist? A Visionary? Join us . . . and find yourself.